Once upon a time, elite athletes who took extreme doses of anabolic steroids were sure that the drugs helped them jump higher, run faster, grow stronger. But these notions had never been verified in a lab. So in 1975 a British physiology professor at the University of Leeds, G. Romaine Hervey, set up an experiment to determine whether high doses of steroids truly boosted athletic performance or just gave users a psychological edge. "We knew young men who lifted weights felt that anabolic steroids helped them lift more, but we really didn't know [if they did]," says Hervey, now 83. "And since steroids did seem to make them bigger, we wanted to see whether that was normal muscle or water or something else." It was a worthy inquiry, but Hervey was undone by one monumental oversight: He allowed 25-year-old Tony Fitton to observe the study. 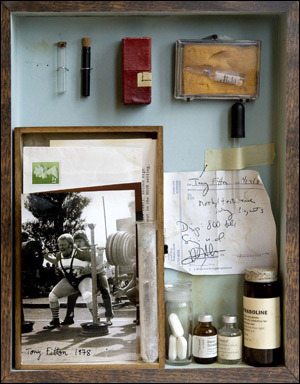 An industrial chemist and a top British powerlifter, Fitton watched with delight as the 11 subjects, gathered in a hotel room near campus, received boxes of the anabolic steroid Dianabol -- a drug he had been regularly using for three years. The instant Hervey left the room, Fitton took over. "Lads, the dosages are a bit high," he said of Hervey's regimen of 20 five-milligram tablets a day for six weeks. "If you feel more inclined to taking just two tablets a day, I'll buy [the rest] off you." As Fitton recalls, almost everyone in the room accepted his offer. Naturally, the subjects did not show appreciable strength gains at the end of the study. Fitton, meanwhile, had procured a cache of Dbol that he could deal or dole out to his lifting buddies. Unaware that his experiment had been sabotaged, Hervey wrote in the influential medical journal The Lancet, "The results did not support the belief that anabolic steroids increase strength and performance." Although some lower-dosage studies showed contradictory results, Hervey's high-dosage trial held sway in the British and American sports medicine communities. In 1976 a former president of the American College of Sports Medicine, Dr. Allan J. Ryan, called steroids "fool's gold." A year later, another former ACSM president, Dr. David Lamb, wrote that the "administration of anabolic-androgenic steroids . . . does not of itself bring about any significant improvements in strength, aerobic endurance, lean body mass, or body weight." The Food and Drug Administration and the American Medical Association echoed that skepticism for a decade. As recently as 2006 the entry for Anadrol-50 in the Physicians' Desk Reference, the bible for pharmaceuticals, had this warning: "Anabolic steroids have not been shown to enhance athletic ability." But the runners and lifters ingesting the drugs knew better. Dianabol, the first oral anabolic steroid, hit the pharmacies in the 1950s and, along with other anabolics, quickly found favor among some high-level athletes. "They would pin those warnings to their wall and laugh at them," recalls Charles Yesalis, a professor emeritus at Penn State and one of the country's foremost experts on steroids. "They had been seeking counsel and hearing silliness. Denying that these drugs worked is still to some extent damaging [the medical community's] credibility today." Hervey's botched study had another far-reaching repercussion: It launched Fitton's two-decade career as a steroid entrepreneur. "I was off to a life of crime," he says now, a smile stealing across his face. By the early 1980s he had moved to the U.S. and was serving thousands of athletes: Olympians, top NFL draft picks, professional wrestlers, cops he'd met through lifting competitions and garden-variety gym rats. As one federal prosecutor said of Fitton in '85, "He may have been the biggest [steroid] dealer in the world." Now a genial, paunchy 58-year-old raconteur who lives off his savings in Rochdale, England, Fitton remains unapologetic. "Life isn't fair," he says flatly, "so why should sports be fair?" The saga of the steroid godfather begins in Rochdale, a working-class town in the moors outside Manchester. A silo-shaped teenager with a thatch of red hair, Fitton grew devoted to weightlifting, his gym an abandoned mill with broken windows that granted entry to pigeons as well as a blanket of fog so thick it often shrouded the barbells. In the late 1960s and early '70s, British schoolchildren were given unlimited free milk. By staying in high school, Fitton realized, he could rack up 10 pints of milk a day (free!) and add all that protein mass. Only after turning 20 did he finally graduate. Fitton went to a teacher training college in Liverpool to become a biology instructor but dropped out after two years and found work back in Rochdale at a foundry lab testing the purity of various metals. There he developed some of the chemistry skills that would help inform his new interest in performance-enhancing substances. Fitton was off on a grand experiment, the kind he grew to love, tinkering with his training and drug regimens to see just how much power he could squeeze out of every limb. In his early 20s he was appointed powerlifting head of the British Amateur Weightlifting Association and in '76 briefly held a world record in the 242-pound class when he squatted 815 pounds. When his marriage crumbled in the late spring of '75, the British tabloid The Daily Mirror ran a story headlined, "Wife Gives Champ the Big Heave." In the article Fitton said, "I have become completely devoted to powerlifting, and my only interest in life is lifting more than I did yesterday." The following year Fitton placed third at the World Powerlifting Championships in York, Pa., and in 1978 he moved to the country at the forefront of powerlifting -- and Dianabol use. "I wanted to learn from [the Americans], beat them and become world champion," he says. Fitton landed in Sidney, Ohio, and went to work for Larry Pacifico, a top lifter and head trainer at a dozen gyms riding the burgeoning fitness craze. Pacifico tasked Fitton with selling gym memberships and devising training regimens. Salesmanship, however, bored Fitton, who got his reprieve less than two years later. Terry Todd, a prominent lifter who also wrote on the subject (and a former contributor to Sports Illustrated), had founded the National Strength Research Center on the campus of Auburn. An acquaintance of Todd's from weightlifting circles, Fitton received a faculty position at the center that he says consisted of little more than helping Bill Kazmaier, a sort of strongman-in-residence, with training. "I didn't even have a bloody typewriter," Fitton says. Kazmaier, who acknowledged using steroids to SI in 1999, was the first man to bench-press more than 660 pounds in competition and later worked as commentator for ESPN's World's Strongest Man broadcasts. Fitton's passion for lifting competitively had long since cooled, but his fascination with steroids had grown. He read books and research papers late into the night, and armed himself not only with pharmacological reference books from Italy and Mexico but veterinary medical texts as well. He welcomed the chance to experiment, and found no shortage of willing subjects in the lifting community. When, for instance, he read that users of the blood pressure medication minoxidil reported that their eyebrows would grow together, Fitton crushed some up, dissolved it and rubbed it on a buddy's bald head. Sure enough, hair sprouted. (Today minoxidil is the active ingredient in Rogaine and other anti-hair-loss drugs, a multibillion-dollar business.) "I liked figuring stuff like that out," says Fitton. Word quickly spread beyond powerlifters about Dr. Hormone, the mad scientist with the lilting accent. While sports physicians and administrators were losing credibility (and wasting time) telling athletes that steroids were worthless, Fitton was telling them otherwise and proving it. "He seemed to [always] know what to do and how to take this and that, safely," Pacifico says. "I think that's why he had a great following." Fitton says that he never actively recruited clients, but when he attended competitions lifters would approach him for training advice. If the discussion turned to drugs, well, Fitton was happy to make some recommendations. Soon, Fitton was working the phones night and day, interviewing doctors and advising trainers and athletes about performance enhancers. A ledger documenting more than a year of his steroid business, which SI obtained in court records, showed orders from bodybuilders, gym owners, college and pro football players, a deputy police chief and a University of Virginia strength coach. Fitton designed a complete steroid training program for several Oakland Raiders that included regular doses of Dianabol and Deca-Durabolin. Inquiries were constant. "The only check I did was, 'Who told ya?' " Fitton recalls. " 'Who mentioned my name?' If it sounded right -- if the person they said, I knew them -- it was all right." Fitton found a pharmacy in Opelika, Ala., that stored the drugs. The supply channel was blessedly straightforward. Fitton would make occasional trips to Spain and Italy, where steroids were legal -- "I'd clean out the pharmacies in Milan," he says -- and fill up his luggage. He would also make periodic jaunts from San Diego to Mexico in a cheap rental car. "The old cars were better, because you could pull door panels off and load s--- in places," he says. "That's what we used to do." Even as Fitton was purchasing huge quantities of steroids, his enterprise was unnoticed by law enforcement. A rumor surfaced in 1983 -- bogus, it turned out -- that Dianabol was going off the market. Fitton rushed to his Alabama pharmacist and ordered as much as he could get: 10,000 bottles. "The pharmacist, the distributor and the companies didn't bat an eye," says Fitton. "They knew damn well the pharmacy didn't need 10,000 bottles for legitimate reasons." Fitton was unencumbered by any moral hang-ups; he saw steroid experimentation not as deviant behavior but as an expression of creativity and ingenuity. Doping, he felt, was a tactical matter akin to, say, applying grease to the legs before deadlifting in competitions so the bar would slide up the body. "If you were working out and you wanted to get the most you could [out of it], you took steroids," he says. "What if a writer could take a smart drug and extend his career? Is that ethically wrong?" In his quest for better drugs, Fitton started to experiment with veterinary products. "At first people said, 'No way, Tony,' " he recalls, "but then everybody was trying it." The most potent anabolic he ever dispensed was a since-discontinued medication called Cheque Drops. Used to keep female dogs from going into heat, the drug had nearly six times the anabolic capacity of the testosterone he was selling to athletes. As Fitton became an authority on animal products, more athletes turned to him with questions. One strength athlete, who now works for an NFL team, showed Fitton a bottle he'd purchased for $500 that purported to contain gorilla growth hormone extracted from the animal's brain. After examining the bottle, Fitton informed the lifter with a laugh that he'd been duped into buying a few bucks' worth of Deca. "I asked him," Fitton says, " 'How common do you think gorilla brains are? It's a bloody endangered species!' "
As his client list expanded -- as if on steroids -- Fitton was remarkably open about his dealings. He adorned the Christmas tree in his Auburn apartment with steroid bottles instead of ornaments. One year he dressed as Santa Claus, photographed himself pretending to stick a needle in his buttocks and sent the photo out as a holiday card. He looked into changing his phone number to 1-800-hormone. Alas, it was taken. "I had no contact with him," says Kim Wood, the Cincinnati Bengals strength coach from 1975 through 2002, "but it was known in the strength world, if you wanted to cheat, this guy, working out of a little post office in Alabama, was the guy. Tony Fitton was doctor and pharmacist." Fitton's approach was less a reflection of his audacity than of societal ignorance about performance-enhancing drugs. After his loss to Larry Holmes in 1980, Muhammad Ali revealed that he had shed weight after taking an excess of hormone, which had been prescribed for a thyroid condition. Today news of an A-list athlete who supplemented his training regimen with hormones would be an international scandal; at the time it was a newspaper story that died quickly. Drug testing that existed was rare and often ineffective. Fitton remembers a nervous NFL player calling him in the early 1980s for advice because he had taken the steroid Winstrol-V and was about to be tested. When the result came back, however, it was negative. After the arrest Auburn fired Fitton. Still, he remained in town, dealing and researching steroids as intensely as ever. He says he advised or sold drugs to athletes and coaches at Auburn, Baylor, Maryland, Nebraska, South Carolina, Virginia and Wisconsin, among others. College players often found him through local weightlifters. "I called the cops on Fitton on several occasions because I knew what was going on," says Virgil Knight, an Auburn strength coach at the time. "But they had bigger fish to go after. They said, 'Steroids? That's a third-class drug.' "
One former Fitton client who played football at a major college program and went on to the NFL, who spoke with SI on the condition of anonymity, says that he never saw Fitton in person, instead placing his orders over the phone. And, though he never set foot on the Lincoln campus, Fitton alleges that several members of the Nebraska football team were regular clients, including Dean Steinkuhler, the 1983 Outland Trophy winner who later, wanting to come clean, admitted to SI that he used steroids. Other college players, including Nebraska offensive tackle Todd Carpenter and Wisconsin center Dan Turk, were listed in the ledger documenting Fitton's steroid business. He recalls that before the 1984 Orange Bowl he received a call from a nervous Husker complaining that he and his teammates had mistakenly left their methyl testosterone -- a chewable supplement that rapidly increases testosterone levels and is thought to foster aggression -- back in Lincoln. Fitton says that he obtained a couple of bottles and sent them overnight in time for the national title game against Miami, which Nebraska lost 31--30. Before the '84 Summer Games, Fitton consulted U.S. athletes and foreign Olympians training in the States and created a brochure of clearance times, a copy of which SI obtained from a former powerlifter. Athletes could consult the document to learn how long they had to abandon a cycle before a test. (Meanwhile, antidoping fervor was rapidly intensifying; with evidence mounting, the American College of Sports Medicine had reversed its stance and asserted that steroids "may" enhance athletic performance, and soon other fitness organizations followed suit.) Fitton affixed his name and number to the pamphlets and made photocopies for roughly 100 athletes and coaches. When a U.S. track and field coach left several copies in a training facility, Fitton received calls from ABC, NBC and CBS on the same day. Fitton remembers telling the careless coach, "You don't have to apologize, but you've got to realize that people aren't as open about this as you and I are." After that incident Fitton changed his phone number and took inventory of his drug contacts. He realized that he had about 2,000 active clients and reckoned that by this time he'd talked to as many as 10,000 steroid users about their experiences, side effects and muscle growth. "It was like one big research trial," he says. "I kept all the [scientific] information in my head." While hundreds of thousands of dollars moved through his accounts, Fitton lived simply. His biggest indulgence was paying for powerlifting friends to travel to international events. If clients couldn't afford a cycle, Fitton might give the product away. He claims that he let one Auburn football player open a metal cabinet in his apartment and take whatever steroids he wanted. Fitton had little interest in currying favor with star athletes. He did most of his business over the phone, taking orders and giving advice starting at 8 a.m. Some days he mailed dozens of boxes of steroids. He'd sit and chat and drink Scotch and wrap up business by 11 p.m. He attended only one football game, reminiscing that a charm of living in Auburn was that on fall Saturdays, while 85,000 people flocked to the stadium, the rest of the town was quiet. Fitton's second arrest came in the fall of 1984 when U.S. Customs agents apprehended him in the border town of Tecate, Calif., for attempting to transport more than 2,000 boxes of Dianabol into the U.S. (He also had notes from multiple doctors approving his transit of drugs; one claimed he was participating in a scientific study on hair loss.) No one had yet been federally prosecuted for bringing steroids into the States, so Fitton was unfazed by his arrest. That changed when the prosecutor, Phillip Halpern, an assistant U.S. attorney based in San Diego, made it clear that he would seek prison time. "I wanted to put steroids on the map," Halpern told SI. Pleading guilty to two counts of steroid trafficking and one count of making false statements to a federal officer, Fitton posted bail of $7,500, then went on the lam for nine months. He settled first in Columbus, Ga., where he concealed his identity by tanning, lightening his hair and jogging daily to slim down to 180 pounds (from 220). Then he went to Albuquerque to watch a competition in which his then girlfriend, Vicki Steenrod, a five-time world champion powerlifter, was participating. Halpern says today that if Fitton hadn't run, he might have gotten off on probation. But after he was picked up in New Mexico, he was sentenced to 54 months in prison. Fitton served 12 months in San Diego and Tucson, then spent the balance of the time on parole and probation. Fearful of returning to prison, he got out of the steroids racket and began working with Musashi, an Australian company that supplied (legal) amino acid supplements to athletes. Fitton likened their taste to "sucking on the dregs of a fish tank." But he believed in the muscle-building powers of amino acids and once wrote in a packet for athletes that they were the best alternative to steroids, if used properly. Old habits, however, die hard. By the mid-1990s Fitton was off probation and back to dealing steroids. Living with Steenrod in Albuquerque, he was again frequenting major powerlifting events. During a '97 trip to New York City, Fitton says, he received an excess of steroids from a source in the Brighton Beach section of Brooklyn -- identified only as "the Russian supplier" in court records. (Fitton claims the man had connections to commercial pilots who would bring steroids from Russia on their flights.) Somehow he ended up with "10 to 15" more boxes of Dianabol than he was planning to distribute. Four weeks later, when cops wearing flak jackets showed up at his door in Albuquerque, they found the pharmacopoeia of pills. Why hadn't Fitton simply disposed of them? "That," he says, with a strained laugh, "goes against everything." He was charged with conspiracy to distribute narcotics and served four months in prison at Fort Dix West, a New Jersey penitentiary -- but not before, according to court documents, U.S. District Judge Sidney Stein delayed his sentencing by seven weeks to allow him to complete unfinished business with the Packers. (Stein did wonder, though, if an NFL team "would be better off to have weight trainers who do not have a history of anabolic steroids.") Upon his release in June 1998, policemen cuffed him, drove him directly to Newark Liberty International Airport and deported him to England. A decade after he says he peddled his last pill, Tony Fitton is living in an austere, two-bedroom apartment that betrays nothing of his role in sports history. Where he once pored over medical books, his current obsession is Texas singer-songwriters. Four thousand CDs line his shelves. He had a stroke four years ago that immobilized his right foot, and he makes his way around town in a white Renault with the pedals customized for a left-footed driver. Fitton married Steenrod, now a nurse in Albuquerque, a year ago, and she comes to visit two or three times a year. Fitton hasn't set foot in the U.S. since he was deported, and is completely out of touch with American sports. He hadn't heard of Roger Clemens. Asked about George Mitchell, the man whose report on performance-enhancing drugs in major league baseball has dominated headlines for the past three months, Fitton replies, "You mean the George Mitchell who settled Northern Ireland?" He has no interest in returning to his former line of work. For all the performance-enhancing drug use he helped facilitate -- by skewing Hervey's study results, by teaching test-skirting tactics, by experimenting with new steroids and distributing trusted ones -- the federations and testing agencies and bureaucrats are beginning to close in on their prey. Fitton believes that if drug testing occurs out of competition, and if the tests are truly unannounced, "the only sure, safe thing an athlete can do is human growth hormone, and a bit of testosterone, and monitor their testosterone levels." And where's the chemist's creativity in that? "I'm just glad we had those years," he says, "when sports were fun."